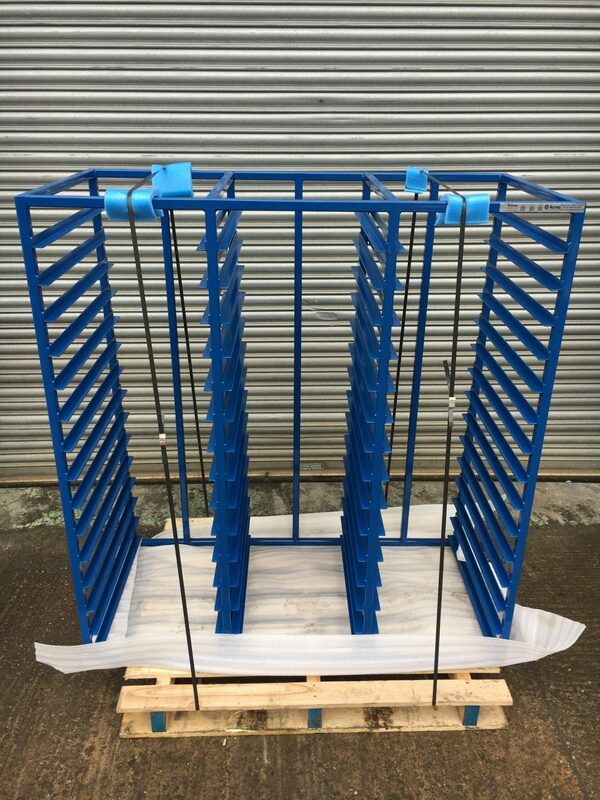 The triple tray rack has been designed and manufactured a midlands based aerospace client for use within the NPI Department of their blade casting facility. The tray racks will store 45 off PE backed foam trays previously supplied. The tray racks consist of 3 columns of 15 spaces to store foams. Each foam stores 6 off wax patterns. The main frame of the rack has been manufactured from 25mm x 25mm mild steel box section which will be fitted with 25mm x 25mm angle guides to support the foams. The solution has been powder coated in R-R blue: RAL 20D45 to provide a long lasting hard wearing finish. Approximate overall size 1500mm (H) x 650mm (D) x 1360mm (W).